OPPO will be launching the OPPO F7 Youth in the Philippines. The handset first appeared on a TV commercial in Myanmar. It looks like the OPPO F7 Youth is coming to the Philippines. We recently received an invitation from OPPO’s local office, confirming the launch of the phone on May 23. The handset was first mentioned on leaked ads of the OPPO F7. 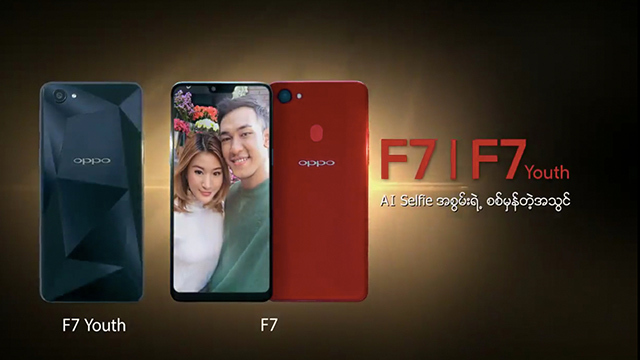 It was once again seen towards the end of an OPPO F7 TV commercial in Myanmar. No other information is available at the moment, but we at least know what it looks like. The screenshot above shows the OPPO F7 Youth will have similarities with the realme 1 and its diamond black back panel. As for the specifications, we can speculate it to be close to the F7 with a mix of realme 1. If that is the case, we could see a handset sporting 6.23-inch full HD+ display complete with notch, a MediaTek Helio P60 processor, possibly 4GB RAM, 32GB storage, and a 3,400 mAh battery. Also, the fingerprint sensor is conspicuously missing from the back panel. Its safe to assume the phone will rely on face unlock for security and quick access. Aside from that, the F7 Youth will most likely run on ColorOS 5.0 based on Android Oreo. It will also have an AI-powered selfie camera. The price hasn’t been mentioned either, but I’m my guess is it will be close to the OPPO F5 Youth, which is around PHP 13,990 or roughly USD 270. None of this is verified, but we’ll know soon enough when the phone launches next week.